A smart example of transitional furniture design, the Galileo Stool from American Heritage will spoil your guests with classic style and contemporary comfort. Designers from American Heritage looked to the past for inspiration when they created this model. The appearance they created is similar to Federal and even Art Nouveau side chairs based on Louis XVI bergères, with the barrel-shaped back, flowing stiles from the backrest to the seat rail and the curved, tapered legs. And while the classic look is complete with Coco bonded leather seats and Navajo wood frames, this stool features a few modern comforts, such as the 360-degree metal swivel mechanism. Introduce a stylish piece of furniture to your residence with the Galileo Stool from American Heritage, which comes in either a bar stool height (30-inch seat) or counter stool height (26-inch seat). This item ships via UPS / FedEx. Most delivery times within the Continental U.S for in stock bar stools range from two to five business days depending on location. 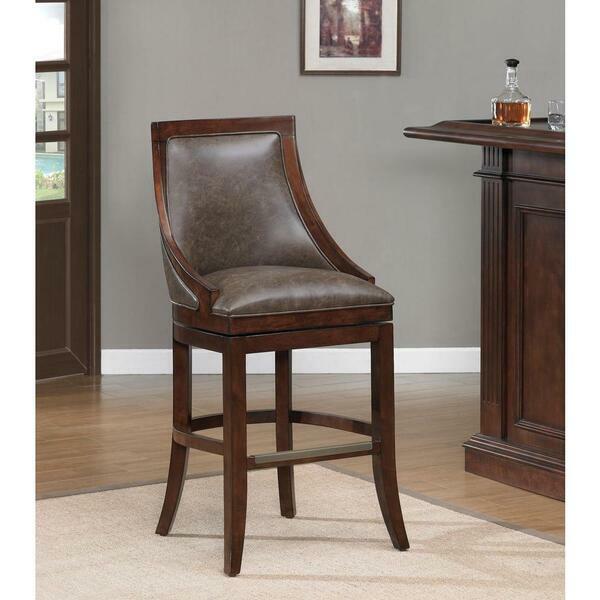 All in stock bar stool orders ship direct from American Heritage or Family Leisure and usually ship within 48 hours from the time of purchase. Shipping Details & Conditions.